The Walking Dead Zipper Pouch: Zombies, Comic Book. Free Gift Included. Hello! Thank you for visiting my shop. <3 Please know that this item was handmade by me on my sewing machine (not in a factory!). Most of the items in my shop are one of a kind or limited edition. 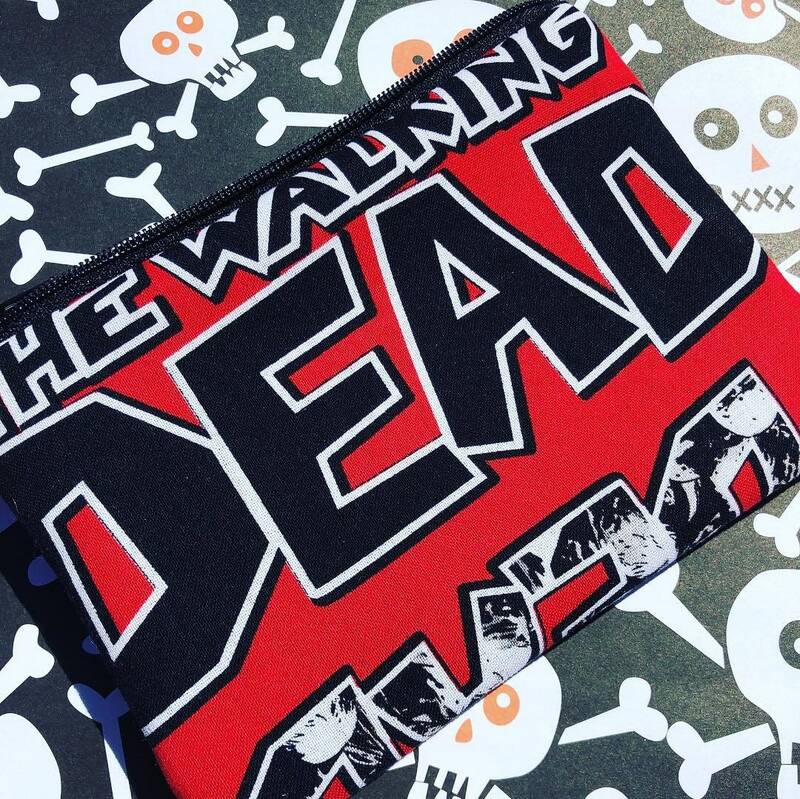 I created this zipper pouch using fabric featuring The Walking Dead comic book logo. I gave the pouch a black zipper and a solid black lining. This pouch has been serged and interfaced for durability. Free gift! This item includes a Glenn & Maggie button for fans of the show. Note on shipping: I use recycled packaging whenever possible to reduce waste. Zombies Zipper Pouch: Horror, Alexander Henry. Free Gift Included. The Walking Dead Tote Bag: Michonne, Comic Book Print. SALE Comic Book Girls Zipper Pouch: Cartoon, Faces. Funhouse Zipper Pouch - Zombie Clowns, Horror. SALE Fearless Zombie Hunter Zipper Pouch: Horror Movie Posters. Deadpool Zipper Pouch: Comic Books, Antihero. SALE Primordial Ooze Zipper Pouch - Mesh, Halloween, Green and Black. Zombie High Zipper Pouch: Zombies, Horror, Alexander Henry. Love it so much! Well made and cute! Popples Zipper Pouch: 80s Toys, Retro, Old School, Nostalgia. I completely adore my new zipper pouch! So cute and awesome quality! Horror Patchwork Zipper Pouch: Zombies, Horror Movies, Skeletons. Glow in the Dark. Super fast shipping. Carries all my stuff and looks fly. Mermaid Zipper Pouch - Tattoos, Lightning Bolt. Payments via Paypal and credit cards are accepted. Items do not ship before payment is received. If you need to cancel an order, it must be done before the order is shipped. Any issues will be handled on a case-by-case basis. Please be aware that any product flaws will be stated in the item description. Measurements are included in each description [if not, please ask! ], so be sure to check them before you make your purchase. Also please pay attention to processing times and know that I will get your order shipped as soon as possible. If you need something really fast, please send me a message before you order and we can work that out. Orders will be shipped out within the processing time listed on the item. Custom orders may require more time, but that will always be discussed with you. If you need an item in a hurry, please ask me about shipping upgrades. All shipments will include tracking information that will be emailed to you when the label is printed. International orders track to Miami but usually don't update after that. Buyers are responsible for their own country's duty fees. DO NOT ask me to change the value on an order or mark an item as a gift. This is illegal, so if you do not want to pay what your country will charge you, do not order. I would love to have you as a customer, but this is beyond my control. Be aware that international shipping can take around two weeks, so plan your order accordingly. Daredevil Cotton Woven Fabric - One Yard. Marvel by Springs Creative. Zombies Zipper Pouch - Shock and Horror. Space Invaders Patchwork Zipper Pouch: Videogames, Arcade, Geekery. SALE Pacman Zipper Pouch: Videogames, Arcade. Comic Book Girls Coin Pouch: Cartoon, Faces. You Choose.